It’s early in the morning and the welcoming show has just opened the Magic Kingdom to guests. The drums of Adventureland playfully dance and put a rhythmic bounce into my neck and head. The sun has barely begun to scrape over the top of buildings, blinding guests heading towards Tomorrowland and burn the sleepy remnants from everyone’s eyes. Throngs of guests are rushing as fast as their hurried paces will let them go, while keeping under the chastising warnings to walk from Cast Members that they pass, in order to be some of the first guests of the day to board the Seven Dwarfs Mine Train, Space Mountain, Peter Pan’s Flight, Pirates of the Caribbean, or Big Thunder Mountain Railroad. They rush past me without taking a second glance as I stand there, silently staring up at my first attraction of the morning, the Swiss Family Treehouse. 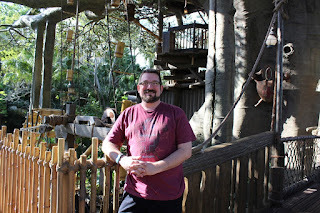 The Swiss Family Treehouse is not my favorite attraction in the Magic Kingdom, but it is high on my list. I should be racing off to fly with Peter over Never Never Land or to visit Tumbleweed on a runaway mine train, but I’m not. I’m standing here gazing up at a faux tree engineering marvel. No one, and I mean no one, is scurrying to be the first one to climb the treehouse, but still I make my way by the oar and canvas canopies and cannons with neatly stacked cannonballs to the entrance. The Swiss Family Treehouse is comprised of 116 steps, climbing up and descending around the trunk of the tree, in addition to stretches of platforms between its different rooms. I take a deep breath, let it out, and begin my ascent. A few years ago, in my early-to-mid-30s, I was diagnosed with the auto-immune disease, Rheumatoid Arthritis. The disease stems from an overactive immune system, causing it to attack healthy tissue, particularly around the joints of the body. If untreated it can cause massive joint damage, but even at the best of times it causes exhaustion. I like to joke that my immune system, which I had built up to an almost bullet-proof level over more than a decade of work with afterschool and preschool programs, was just like me, an overachiever. The drive to make itself stronger eventually led to it collapsing in on itself. The truth is that the auto-immune disease is hereditary on my mother’s side of the family, the side of the family tree that the doctor’s never want to hear you say RA is prevalent on. It can be hard going into the rheumatologist’s office as a young man. Early on, before I became recognizable on sight, I would get praise for being a good family member and be asked who I was there to pick up. The light in the receptionist’s face would dim while she tried to hold her smile in place when I would say I was there for me. Sitting in the waiting room, comprised of mostly individuals in their 60s or older, being the one person in what is considered the prime of my life, waiting to see the doctor is humbling, but you find community. Eventually I will get in to see the doctor, he takes as much time as he needs with each patient. He will gentle shake my hand, tell me it’s not okay when I try to laugh off my current state of pain, and proceed to test every joint to see how stiff and swollen each is. It isn’t comfortable, but it is necessary. There is no way to know how RA is going to make you feel from day to day. It is, as I tell anyone who asks, the worst game of Russian Roulette that you will ever play. Each morning starts with an assessment of how everything feels that day. I’ve had days where I wake up and the pain from the day before is gone or, conversely, wake up in excruciating pain that wasn’t there when I went to bed. When a flare does arrive, it could last hours, days, and forever, there is no way to tell. The next time a flare subsides you could go into remission and never hear from the jerks in your joints again. One thing you should also know about RA is that is also, for the most part, invisible. Certainly on my worst day you can see me carefully clutching a joint that is inflamed, catch a limp in my step, or see me walking with a cane. However, most days you will hear me, and others with the same auto-immune disease, tell you that we’re fine or that we’re doing okay. It is so tough to explain that outwardly we look fine, but internally there is a fire burning in our fingers, knees, and shoulders and we are exhausted after breakfast. Honestly, there are many days that getting up, showered, and dressed is a righteous accomplishment. I cover the pain with jokes, stiff legs that don’t work as well as a table’s leg, clenched up fingers making me look like a t-rex on the prowl. The humor lifts my spirits and makes everyone more comfortable. There is no cure for Rheumatoid Arthritis. There are treatments, but it is worth knowing that even the best treatment plans do not work for 100% of those diagnosed with the disease. So you learn to live through trying a lot of different medications, trying different combinations of medications, messing with dosage levels, and a lot of faith, trust, and pixie dust. I consider myself lucky. Remember that waiting room I told you about? Being whacked by this vicious disease while I am younger means I have the blessing of time, the hope that a cure does come along in my lifetime. There have been advancements in the past couple of years, nothing that approaches a cure, but enough to keep me moving forward with hope. In middle school, high school, college, and even a few years after, I was a running fool. I would run for hours just to be alone with my thoughts, and I loved it. The same man who once ran the Walt Disney World Half Marathon on nothing more than muscle memory now gets winded climbing up his hilly driveway and most days I have some sort of cane or walking stick to make sure I don’t lose my balance and end up falling and hurting myself. I walk when and where I can, because some movement is great, but sometimes going too far makes it worse. It’s all in knowing your body and how far you can push it to balance yourself on the edge of the staying healthy knife. This brings me back to standing at the base of the Swiss Family Treehouse. As a child I would run to the bamboo water carrying system and stretch out as far as my little hands would let me, fingers trembling as I strained them to their limits, just trying to knock over one of the water cups. I don’t believe I was ever successful. I would try not to knock other guests over as I sped my way up to Fritz and Ernst’s room, loving the idea of sleeping in a canvas hammock and wondering if Walt Disney World would ever let me spend a night in the room, and then dance over to the call of Swisskapolka as I pleaded with my father to build me a treehouse just like this one. The Swiss Family Treehouse never replaced Big Thunder Mountain or Peter Pan’s Flight in my heart as my favorite attraction, but it was always something I wanted to do. With guests hastening off to their first destination, hitting that must-do attraction or sticking to their plan of attack, I start up the first set of stairs. I come to the Swiss Family Treehouse early because it is still mine to do. 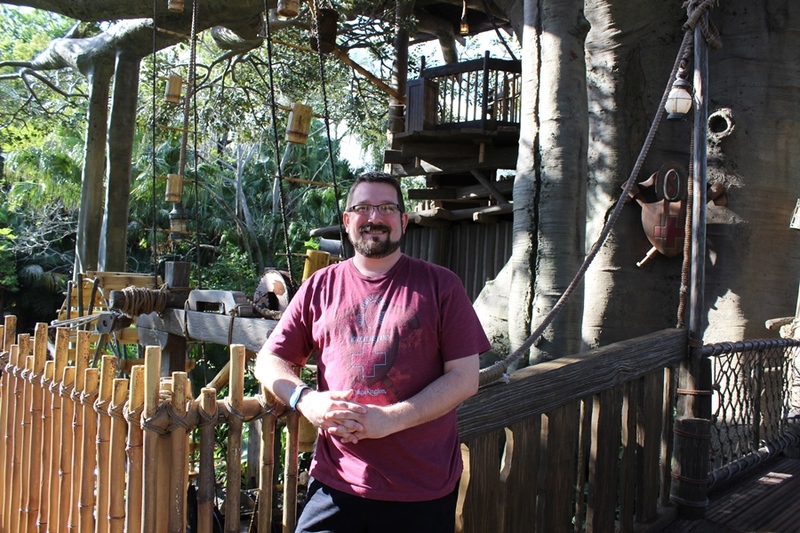 I won’t bottle up anyone else’s experience as I slowly climb my way through the treehouse, still daydreaming about swinging from the branches into my hammock and enjoying the view as I look out across the entirety of the Magic Kingdom peaking from between the branches. The ability to have my own joy in the experience and to not add stress to anyone else’s amusement of this timeless beauty, that is why I come to the Swiss Family Treehouse first thing in the morning. There’s one last reason I return to the Robinsons’ tree time and time again these days. A small tingle lingers at the back of my mind, a whisper that I try to ignore. If a cure doesn’t come, if a flare bursts into my joints and never leaves, then I know that there is a day coming when I will only be able to look up longingly at the Swiss Family Treehouse. I won’t be able to climb it limbs and marvel at its artistry up close any longer. The idea sits like a cold, damp rock lodged in the pit of my stomach. I shake it off and climb the next step. Ryan, Thank you for sharing your story and thoughts. So much of what we love at WDW is tied to the experiences we had as children. It's the perfect place to bring it all back - even just for a few minutes. No one can take those memories from us.